If you go to any supermarket in the United States, you're likely to be faced with an entire wall's worth of cleaning products to choose from. Of course, it's hard to know which ones will be the most effective both in terms of cost and in getting things clean. This blog post is dedicated to the business of separating the wheat from the chaff when it comes to picking out products to clean your own home with. Of course, we at Glossy Clean are more than happy to take care of your home most of the time, but that doesn't mean that it's a bad idea to have some products on hand to deal with spot cleaning between visits! 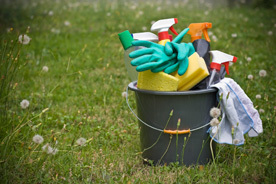 The first thing that you'll have to decide on is how important using green cleaning products is to you. There are a number of advantages in choosing green cleaning products: namely, they offer a higher quality of air in houses that use them, and the products are often formulated in such a way as to ensure that the environment is protected. If you buy green, you're buying products that are made specifically to both protect your family and the environment! The problem with green products is that they do tend to be more expensive than conventional cleaning products, and some of them require a bit more elbow work in order to get the kind of clean that you're used to if you've been using conventional products for a long period of time - since green products contain fewer chemicals, they require a bit more work to give a house that spotless glow. To this end, we've made a list of products we recommend that are both conventional and green in scope. Pick and choose for a mix and match cleaning batch that works for you!